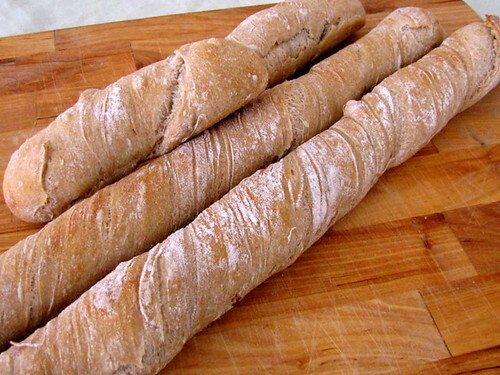 Twisty Baguettes ~ I Can Do That! David Lebovitz's blog never fails to inspire me. The latest is the USA-made hazelnut spread on holey twisted baguettes. The hazelnut spread looks really really yummy but the steep price is preventing me from getting a jar. I am more than happy and willing to make the twisted bread instead which is the more interesting of the two. I have never heard of twisted baguettes which are supposed to be Swiss in origin. 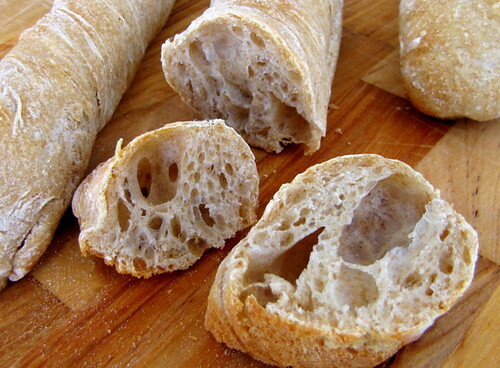 After reading about it here, I decided to use Peter Reinhart's pain à l'ancienne rustic bread recipe because I love its natural sweet flavor and ease of preparation. I altered the recipe a bit by substituting whole wheat flour for 5 ounces of the bread flour and increased the resting time between folds from 10 minutes to 30. The holey sweetish thin mini baguettes are superb and I love it with Nutella, of course, and with creamy spreadable just-made buttermilk cheese. I also made tiny ones, 6 inches in length, with a piece of bittersweet chocolate baton inside. It's very good but some of the chocolate oozed out and made a little bit of a mess. What I love about the twisted shape is there is no need to score the loaves and they come out looking nice. I'll definitely make these again and will follow Jeffrey Hamelman's French Bread with Poolish recipe just to compare the flavors. Combine all the ingredients in a large mixing bowl and stir with a wooden spoon for 1 minute until well combined. The dough should be coarse and sticky. Let the dough rest for 5 minutes to fully hydrate the flour. Mix for 1 minute in machine or by hand using a wet spoon or wet hands. The dough should become smoother but will still be very soft, sticky, and wet. Transfer the dough to a lightly oiled container, cover with plastic wrap and let rest at room temperature for 30 minutes. Transfer the dough to a lightly oiled surface. With wet hands, stretch and fold the dough: reach under the front end, stretch it out, and fold it back onto the top; stretch and fold the 3 remaining sides. Flip the dough and tuck into a ball and return to the container. Cover and repeat the stretch and fold 3 more times at 30 minute intervals. After the final stretch and fold, immediately cover with plastic wrap and refrigerate overnight or up to 4 days. On baking day, remove the dough 1 hour before baking. Place a sheet pan on the bottom shelf of the oven and put the rack and stone in the lower middle shelf or wherever you want to position them. Preheat oven to 475°F for at least 45 minutes before baking. Place the dough on a generously floured work surface and shape into a 12 x 8 inch rectangle. With a metal pastry scraper, cut off a slice 1½ inches wide and roll on the flour. Stretch to elongate and make it thinner, if desired. Twist the dough from end to end (or from middle to both ends) and carefully transfer on a sheet pan lined with parchment; if baking directly on a stone place the shaped baguette on a piece of parchment laid on top of a peel or inverted sheet pan. 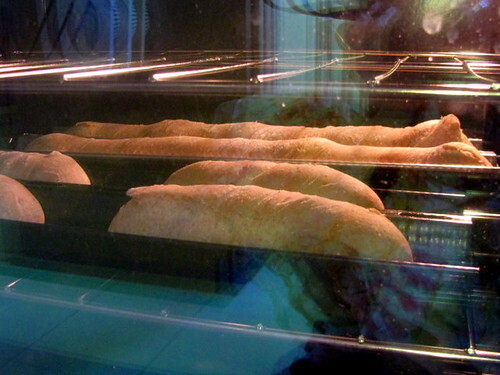 Slide the baguettes on the stone or place the sheet pan in the oven. Pour ½ cup hot water on the bottom pan and bake for 12 to 18 minutes or until the crust is a rich brown. Cool baguettes on a wire rack for 15 minutes before slicing. Gosh,I LOVE LOVE LOVE THESE! will seriously consider this recipe, thanks so much! I am so glad that you didn't get blown up. I love nutella on bread, these look delicious. I love this recipe. I can't wait to try this. These are lovely. I have to take out my Reinhart books again.